Get an inside look at science as it happens in the Caribbean. This week we watch a frog invade St. Kitts. A young Cuban Tree Frog, freshly transformed. For a long time, it was very hard for a frog to cross the sea. A lizard can cling to a fallen tree and drift to the next island—not easy, but not impossible. For a frog, a voyage at sea is almost always deadly. Salt from the sea water poisons the frog, while also dehydrating the frog. The Cuban Treefrog needed human help to make its great conquests. One of its first stops was Florida. It probably hitched a ride on a cargo ship in the 1920s. It prospered there, and was well positioned to invade new islands in the Caribbean. Many new species come to the Caribbean from Florida because there is so much trade between Florida and the West Indies. Imported plants and trees are a key source of accidental introductions. Lizards, frogs, snails and insects have all traveled unseen in plant shipments to new island homes. With human transport, the Cuban Tree Frog has become one of the most successful invaders. Although it needs water for its tadpoles, it has managed to survive in dry islands like Anguilla and Bonaire. It will use any source of water available, from wells and ponds to mud puddles. If tadpoles are trapped in a shrinking puddle, they will eat each other to improve the chances that at least a few survive. 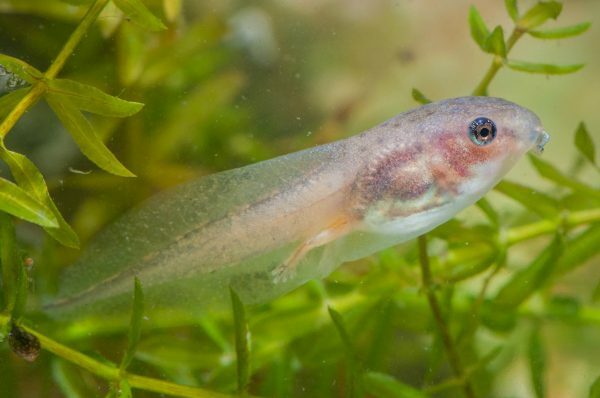 This tadpole is already growing legs. Surprisingly, the Cuban Tree Frog was not documented on St. Kitts until this year. It has been on many nearby islands for years, including Nevis. The wet forests of St. Kitts are certainly suitable habitat for this frog. Perhaps it was just luck that this species was not introduced much earlier. The timing of the frog’s arrival does allow us to watch as it spreads around the island. If we check for tadpoles in freshwater habitats, like ponds, wells and roadside ditches, we can probably see how it moves across the island. Because the tadpoles need fresh water it is easy to monitor specific locations over time. One interesting wrinkle is the presence of the Cane Toad or Crapaud. This species has been on the island much longer, and its tadpoles also need freshwater habitat to survive. 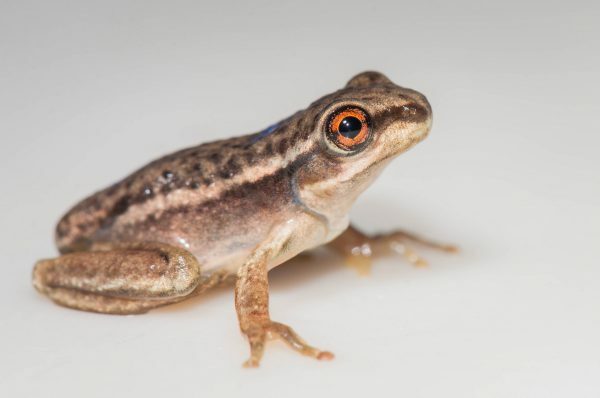 During surveys on St. Kitts and Nevis, no locations had both Cane Toad and Cuban Tree Frog tadpoles. It was always one or the other. In spots with tadpole-eating Tilapia and large crayfish, neither species was found. How will the Cuban Tree Frog take over St. Kitts? How long will it take? How will relationships with other species impact the process? It is a fascinating opportunity for study. It’s also a chance to learn more generally about how invasive species invade and how they harm native life.